Life has been busy of late, so this will be a quick farm update. Our squash continues to grow like mad, but the zucchini is finished for this year. 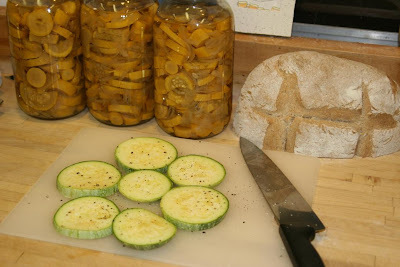 Here's a look at some canned squash - a future yummy meal - and our last zucchini. We went with heirloom round zucchinis this year and were very pleased. They were excellent just about any way Scott cooked them! 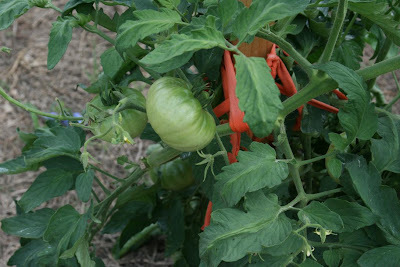 The tomatoes are trying to get ripe. We've eaten a couple of mortgage lifters and yellow pears, but the intense heat and a multitude hungry rabbits have taken their toll. We've eaten several ears of silver queen and should be canning corn like mad before the weekend. 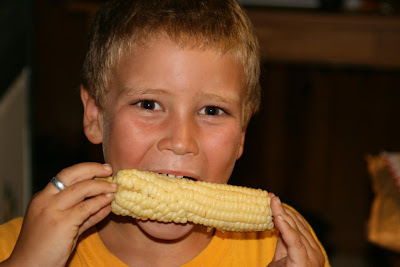 It's hard to beat a fresh ear of corn! We've also had a few weird farm moments. The following is by far the largest egg we've seen yet, and we fear the chicken that laid it may never be the same. We were hoping for triplets, but alas the egg only produced a deformed set of twins. 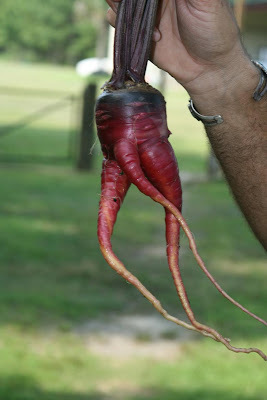 No comment on the carrot. I think the picture says it all! Our herons babies are growing up. 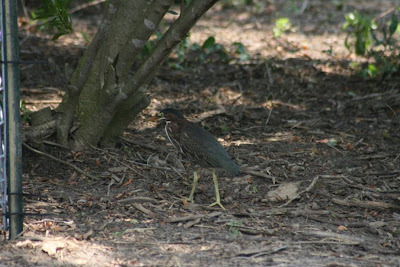 This juvenile green backed heron was spotted drinking out of the pigs' water bowl. I saw a frog in the bowl later so it may well have been fishing. We weren't quick enough with the camera to catch him in the bowl, but were still impressed that this guy let us get so close. I'll try and blog more soon! Why would a southerner lock his car with the windows up in July while parked in a known safe location such as the church parking lot? 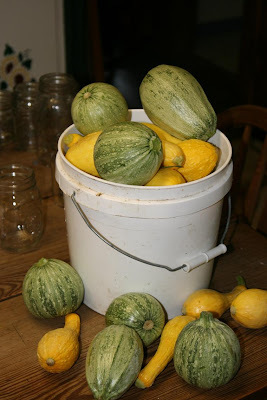 To keep friends and neighbors from filling the car with squash! Our garden is exploding with squash and zucchini and the tomatoes aren't far behind. We expanded the garden this year and decided to try some new varieties including round zucchini, open pollinating corn and heirloom tomatoes. Our favorite tomato so far is Radiator Charlie's Mortgage Lifter. Our preference is based solely on the name as we haven't eaten any of them yet (just one more week to go!). Scott grew all our tomatoes from seed this year, and they're all heirloom varieties - Mortgage Lifter, Red Pear, Yellow Pear, Cherokee Purple, Katinka Cherry, Indian Stripe, Principe Borghese and Romas. Good thing Scott likes canning! 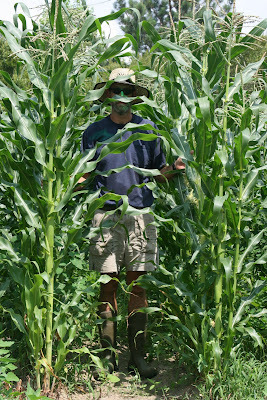 Our Silver Queen corn is doing fabulous as is our Wapsi Valley, a open pollinating variety given to us by a friend. The Silver Queen is hard to beat for good eats, but the Wapsi is absolutely georgous. The kernels can be either red or yellow, are quite large and should grind into excellent grits and corn meal. Due to heavy rain our potatoes didn't make it, and due to a bumper crop of rabbits our beans, peas and peanuts are struggling. We have an electric fence around the garden to keep the deer and pigs out, but the long-eared rodents have bypassed it with no problem. They've had a field day in our garden, and even tried to establish a nest in the carrot patch! 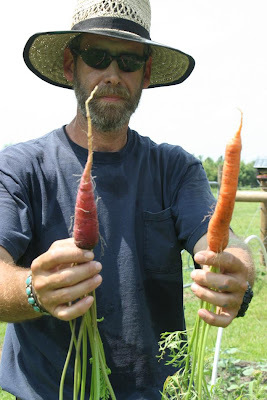 Check out that Cosmic Purple carrot on the left - it's orange on the inside and tastes wonderful. We harvested an exceptional crop of Vidalia onions and Russian Garlic this summer, and our asparagus and hot peppers are looking great too. Earlier this spring, however, we had a bit of a garden tragedy and I figured now was as good a time as any to describe what happened. It was around 10am in the morning and Scott was calling for help in the garden. Not just help weeding (which I pretend not the hear), but "help!". I could see that he was squatting over something and working on it at a feverish pace. 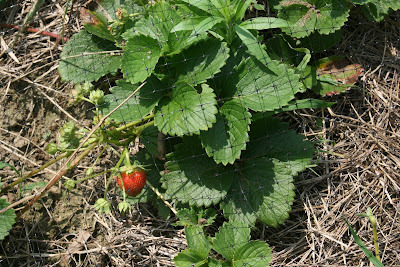 We have netting over our strawberry plants to keep rodents from enjoying the fruits of our labor. The prior evening the wind had blown the netting into a pile, and I remember telling Scott that we needed to straighten it and stake it down. Needless to say, we forgot, and now the netting was in a tangled mess at Scott's feet along with two large snakes that were trapped inside. One was alive, the other...not so much. With my assistance Scott freed the larger snake (a male?). He didn't look very good, but he did slither away after being freed. Then we detangled the smaller (female?) snake and threw her over the fence to see what the pigs whould make of it. Okay, okay, I know it sounds a little gross, but American Guinea Hogs are supposed to be ruthless varmit killers and we wanted to see their reaction. It was amazing. Their little snouts started working overtime as they slowly approched the dead reptile. Then, once within about 6 inches, they'd squeal and run away. So much for being killers! Ahhh, but time heals all wounds...so to speak. Or maybe it's simply that hunger will make us do things we might not otherwise do. Everybody knows the "Alive" story about the soccer players in the plane crash over the Andes. Well, our pigs aren't cannibals, but by 5pm they were very hungry and that snake must have started looking and smelling good because Magnolia was walking along with a large mustache dragging the ground on either side of her. Crunching sounds and sister Scarlet were only seconds away. Bo avoided the fray initially....I do need to keep a check on how much feed he's getting... but he eventually gave into the feeding frenzy. We were really bummed to lose the snake....well, potentially many snakes. The male will hopefully make it, but our theory is that the snakes were in a mating ball when they unfortunately discovered the netting and got tangled. A bummer of a way to go (I guess) and a shameful loss of some really good rodent hunters. 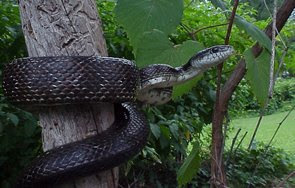 We later identified the reptiles as Rat Snakes, and they were probably protecting our strawberry crop from field mice. Oh well, it was an excellent opportuity to watch the pigs get a little primal, so we'll take the good with the bad and try to be more careful with the netting in the future. Where does our food come from? What type of life did it lead? What was it fed? Was it given antibiotics? Was it happy? These are some of the questions that led Scott and I to start Bluefield Acres - a homestead farm in Bladen County, NC. We want to eat meat that's free of unwanted chemicals, preservatives and medications; food that's led a happy, stress-free life prior to providing us with valued nutrition. Today we slaughtered and butchered our first guinea hog, which is why I'm thinking about this out loud. The hog wasn't one that we'd raised, but one raised by a colleague and friend. 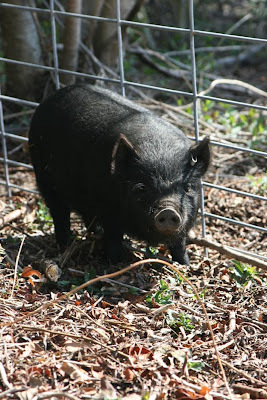 The boar was about a year old and led an idyllic life on a beautiful farm in Chatham County prior to becoming food. He was raised on pasture and alfalfa and spent his days roaming a 14-acre farm . Taking a life is not an easy thing, but hogs are food and this one was slated as a feeder pig from birth. He never knew what happened. Life just ended while enjoying a treat of cracked corn, then the process of slaughter and butching began. He only had one bad second in a happy life. We started the day early (6:30am) as the forecast called for temperatures in the 90's and high humidity. Not ideal conditions for the task at hand. After the boar was killed and bled, we scalded it in a large tub to loosen the hair for removal. The scalding water must be at 150 degrees and you only scald the hog until the back and jowl hair comes out freely. Scald it too long and the hair will set; too short and the hair won't come out. We left it in the water for about 1 minute and used our tractor to dip and remove the carcass. 6:45 am - The hair was removed by scraping the skin with a knife. 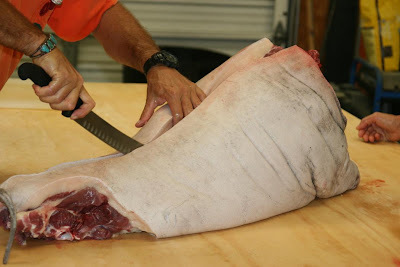 After the hair was removed and the hog washed, we brought it inside our air conditioned workshop to remove the internal organs (7:00 am) and begin the butchering process. We're happy to report that the organs looked extremely healthy and the hog was free of parasites. 7:30 am - Scott broke the hog into primal cuts that we put immediately onto ice then brought back out to further process after chilled. 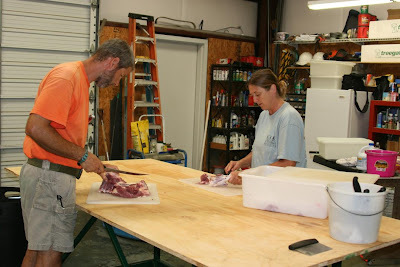 We used a cloroxed sheet of plywood and plastic cutting boards as our work surface. Fatback and random pieces were saved for making sausage; hams and shoulders were cut into small roasts; loins, tenderloins, ribs and bacon were cut out separately; select sections of fat were saved for rendering and neckbones were saved as well. We were done with butchering by 10:00 am, then cleaned up and retired to the house to process the sausage. American Guinea Hogs are small in comparison to commercial hogs. Commercial hogs are grown quickly in confinement and slaughtered at 6 months when they weigh around 300 pounds. 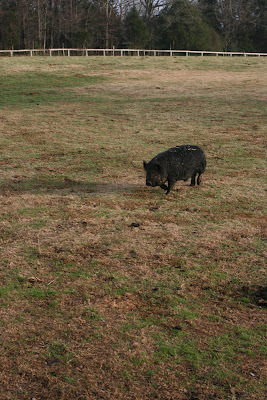 AGH's are grown slowly on pasture and at slaughter we estimate that this one-year-old boar was around 150 lbs. By growing American Guinea Hogs slowly on pasture as opposed to grain, you get a richer tasting meat that is higher in nutritional value than commercial pork. 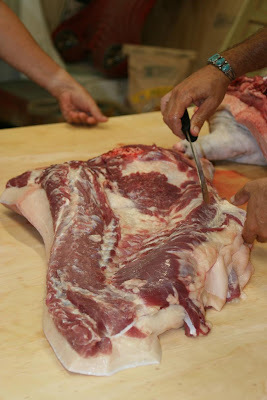 By knowing where the hog came from, we were assured that it was raised humanely and without unwanted additives. I worried that looking my food in the eye before processing it might be a problem, but in truth it wasn't. I am truly thankful for what this boar will provide in the way of meat and know it led a good life worth celebrating. There's a movie that's just been released call Food Inc. - http://www.foodincmovie.com/. It's asks a lot of questions about where our food comes from, how it's handled, and what the food industry doesn't want us to know. I haven't seen it yet, but plan to see it soon. America has become extremely efficient at producing cheap food, which has its positives, but unfortunately it has its costs as well. What's your food worth? Having free range chickens is great. They're easy to take care of, keep the fire ant population down and produce copious quantities of eggs! We have 13 hens, 2 roosters, and get anywhere from 10-13 eggs a day. 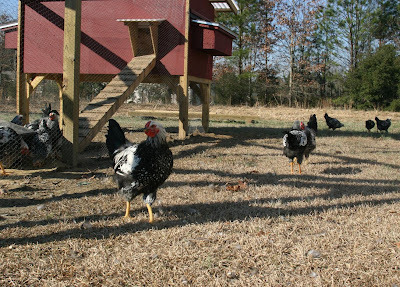 Our Wyandotte chickens free range on our land and use approximately 5 of our 20 acres. We've read that chickens will only range about 500 feet from the coop, but our birds regularly explore further. 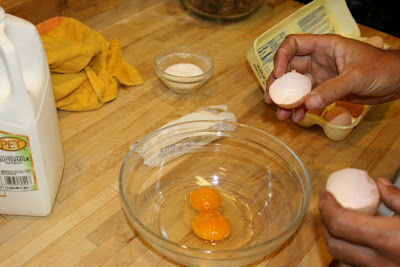 The eggs are incredibly delicious and very different from commercially produced eggs. According to Mother Earth News, free range, pasture fed chicken eggs have 1/3rd the cholestrol, 1/4th the saturated fat, 2/3's more vitamin A, 2 times the omega-3 fatty acids, 3 times the vitamin E, and 7 times the beta carotene of eggs produced by cage raised hens. They also come in a variety of sizes and colors, which is one of my favorite parts. 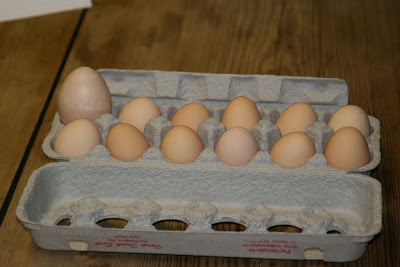 We get "cone-head" eggs, round eggs, and giant eggs to name a few. 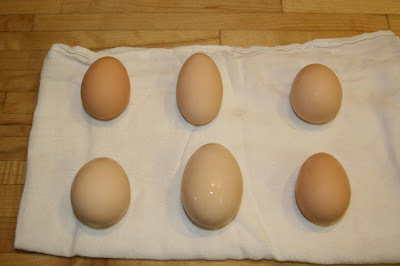 The giant one in the group below was a double yoke. All of our hens produce brown eggs, and while the darkness of the shell varies, all yokes are bright orange. This comes from eating lots of bugs and other good stuff that you don't find in chicken feed. When you have as many eggs as we do, you have to get creative about what you do with them. Today we're having deviled eggs for lunch, and we had scrambled eggs for breakfast yesterday. (I do hope that cholesterol statistic is correct!) Last week Scott made a beautiful fritatta with our eggs, home grown broccolli, onions, & garlic and store bought bacon (we're looking forward to home grown bacon as well). A fritatta is an italian dish that is sort of a cross between an omelet and a quiche. 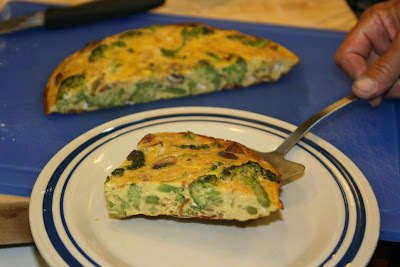 You start the frittata in a frying pan much like an omelet (saute your vegtables, add meat and eggs) and cook it on medium until it will slide loose in the pan, then move everything (pan included) into the oven and cook at 375 degrees until a toothpick will come out clean (30-45 minutes). We have eggs for sale as well, but for now they're in a strange location. I'm working in Holden Beach for the summer so we're selling them at the place I work - www.outsidesouth.com. Hopefully by next year we'll have more chickens and enough eggs that a booth at the Wilmington Farmer's Market will be warranted. That's the goal! Wife, business manager, and pig-farmer . . . amongst other things.